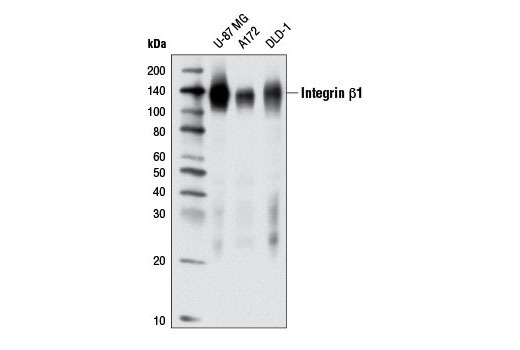 Western blot analysis of extracts from various cell lines using Integrin β1 (D2E5) Rabbit mAb. 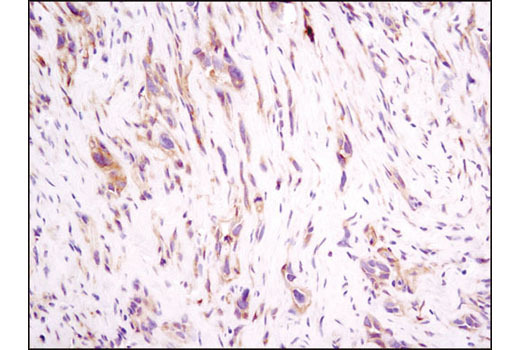 Immunohistochemical analysis of paraffin-embedded human breast carcinoma using Integrin β1 (D2E5) Rabbit mAb. 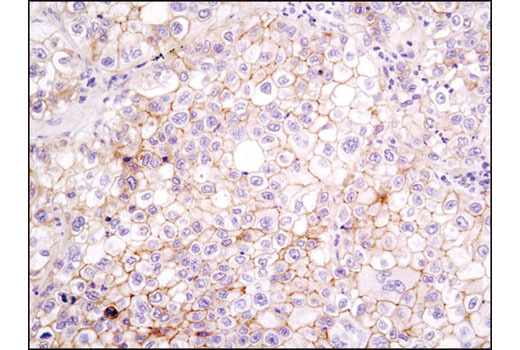 Immunohistochemical analysis of paraffin-embedded human lung carcinoma using Integrin β1 (D2E5) Rabbit mAb. 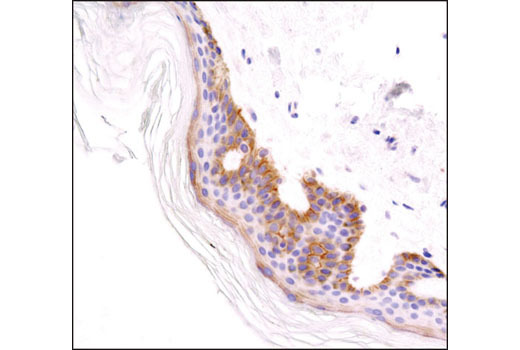 Immunohistochemical analysis of paraffin-embedded human skin using Integrin β1 (D2E5) Rabbit mAb. Integrin β1 (D2E5) Rabbit mAb detects endogenous levels of total integrin β1 protein. Monoclonal antibody is produced by immunizing animals with a synthetic peptide corresponding to residues surrounding Pro680 of human integrin β1 protein. Integrins are α/β heterodimeric cell surface receptors that play a pivotal role in cell adhesion and migration, as well as in growth and survival (1,2). The integrin family contains at least 18 α and 8 β subunits that form 24 known integrins with distinct tissue distribution and overlapping ligand specificities (3). Integrins not only transmit signals to cells in response to the extracellular environment (outside-in signaling), but also sense intracellular cues to alter their interaction with the extracellular environment (inside-out signaling) (1,2). The β1 subfamily includes 12 distinct integrin proteins that bind to different extracellular matrix molecules (4). Control of extracellular integrin binding influences cell adhesion and migration, while intracellular signaling messages relayed by the β1 cytoplasmic tail help to regulate cell proliferation, cytoskeletal reorganization, and gene expression (4). Research studies have implicated β1 integrin in various activities including embryonic development, blood vessel, skin, bone, and muscle formation, as well as tumor metastasis and angiogenesis (4,5). Liu, S. et al. (2000) J Cell Sci 113 ( Pt 20), 3563-71. Hood, J.D. and Cheresh, D.A. (2002) Nat Rev Cancer 2, 91-100.
van der Flier, A. and Sonnenberg, A. (2001) Cell Tissue Res 305, 285-98. Brakebusch, C. and Fässler, R. (2005) Cancer Metastasis Rev 24, 403-11. Mettouchi, A. and Meneguzzi, G. (2006) Eur J Cell Biol 85, 243-7.